Karou is a young artist studying at a private high school. She is exceptionally talented and her sketchbooks are the talk of the class, her pictures of monsters and demons captivate those around her. The thing with Karou is though, she never draws anything she hasn’t actually seen. Karou has a secret life. Her best friend knows she often disappears to run errands but she doesn’t know any more than that. Karou works for her guardian Brimstone, a chimera magician, she knows he sells wishes and that there is a door in his subterranean chamber that she is not allowed to go through. Much about him and the chimera she associates with is unknown to her, she knows about the hidden Elsewhere but not what is going on there. 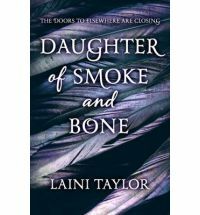 Living a life in two worlds is taking it’s toll and Karou feels torn, as if she doesn’t know quite where she belongs, as if there is some vital part ofher life that is missing. Then one day she battles an angel and things will never be the same for her again, especially as the doors to Elsewhere are closing. Cut off from the only family she has ever known Karou is determined to find out what is really going on, the truth though is far more complicated than she ever could have guessed. This is an incredibly captivating story. The detail and description is exquisite. You can not only see but feel the worlds Karou inhabits. Taylor has done a masterful job seemlessly blending the real with the fantastical. Karou is a layered and torn character not always right, or noble (see her use of ‘scuppies’). She doesn’t stand on any high ground she just lives, inhabiting the worlds she is pulled between. She never plays for sympathy but is so wonderfully drawn that you are with her every step of the way. Throughout her journey Karou is accompanied by an array of equally fascinating characters who are portrayed in such a three dimensional way that they all live on the page. Sometimes characters feel as though they are there to fulfill one task or fill in space, that outside of that one thing there is nothing, this is not true of these characters they breathe with lives of their own when Karou is not around. It’s tempting to go on but I don’t want to spoil it. If you love a bit of fantasy, I’m sure you’ll love this. It’s also refreshing to find romance that is sweeping in it’s scope and not at all angst focussed or involving being torn between two partners. This is one of those books that straddles markets. Some will say this is straight fantasy, others more young adult. For me it fits the criteria of a young adult fantasy, which makes me happy as I loved this book and am eagerly awaiting the next one.